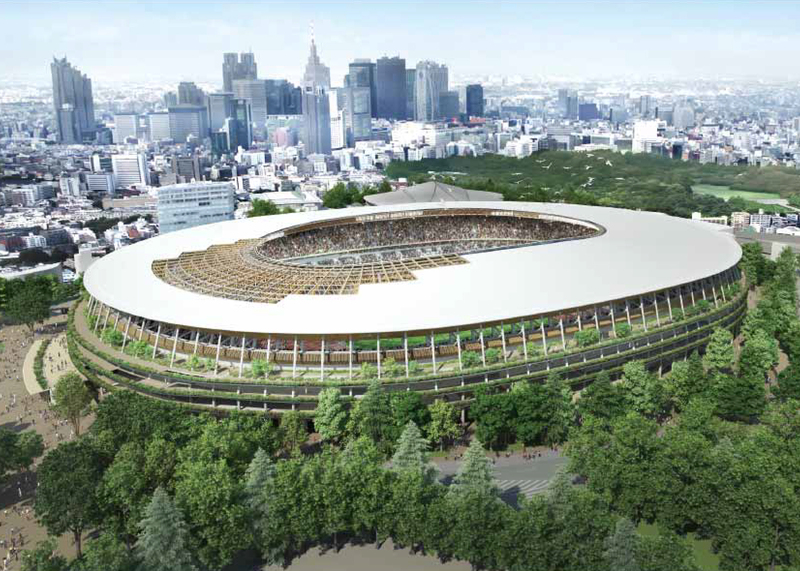 Japanese officials have selected a wooden lattice design by Kengo Kuma for the new National Stadium in Tokyo, which will be the centrepiece for the 2020 Olympics. According to local sources, the decision to award the job to Kuma – one of Japan's leading architects – was announced this morning in a government cabinet meeting. His design had been revealed just days before as one of two finalists in a new competition organised after the Japanese prime minister scrapped plans for a stadium design by British architect Zaha Hadid. The other design in contention was created by Toyo Ito, another of Japan's most famous contemporary architects. Both designs had officially been presented anonymously, but commentators were quick to match the names to the schemes based on the style of each architect. Kuma, who is known for his use of natural materials, created an oval design with a latticed framework that appears to be made at least partly from wood. Circulation areas around the edge of each level also feature plants and trees and exposed terraces. Ito's design favoured modern materials, with an undulating ring of transparent roofing around the roof's central opening. The designs were assessed by a review panel assembled by the Japan Sport Council, which included architecture and landscape design professionals. According to the Japan Times "Japanese-ness" was a key factor in choosing the winning design. Panellists were also asked to grade each proposal on cost and expected construction time. The budget for the stadium is ¥155 billion. Japan has just over four years to finalise and build the winning design. Hadid's scheme, which her firm won through an international competition and had worked on for two years, was scrapped by Japanese prime minister Shinzo Abe in July. He blamed spiralling costs for the decision, but also said he had been listening to popular opinion. Both Ito and Kuma had been among the Japanese architects who protested against Hadid's stadium design. "They don't want a foreigner to build in Tokyo for a national stadium," Hadid told Dezeen, describing the Japanese architects that were opposing her design as "hypocrites". Hadid said that her firm's own warnings about costs had been ignored by Japanese officials, and that she had offered to revise her plans to make sure the stadium could be delivered in time for the Olympics. The design had already been scaled back in 2014 following criticisms over scale and cost. Architect Richard Rogers, who was on the jury that originally selected Hadid's design, said the decision would result in a poorer quality stadium for the Tokyo 2020 Olympics and damage Japan's credibility.